050.Pat Badani – JavaMuseum 2010 – Celebrate! Pat Badani’s intermedia work examines notions of space, place, cities, communication, global processes and digital environments. “Where are you from?” explores aspects of mass migration, world travel and global processes. 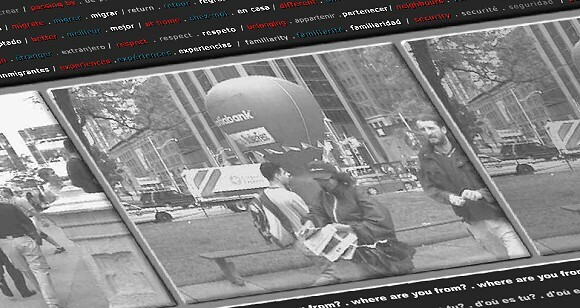 Notions of identity and belonging articulated through mobility are revealed through 3-language video-clips (English/French/Spanish) with testimonies from citizens-at-large that I have collected since 2002 in several world cities. The clips are hyperlinked to a vocabulary of frequently used words extracted from these archived testimonies. This is an evolving piece, with new video-clips archived and uploaded on a regular basis. In 2002-03, I set off to trace my personal geography through 6 cities, as shown in the alternating documentary photographs taken in Chicago, Montreal, Toronto, Mexico City, Buenos Aires and Paris. I video taped 10 to 15-minute conversations with people I encountered. I opened dialogue by asking a simple question that everyone can relate to: “Where are you from?”. Through my prompting, based on a system I have developed through cultural research, I involved participants in conversations about their quest for a better life. Often located elsewhere, the quest for a better life is endemic of modern living where no place is contained and no home fixed. In his book “The Location of Culture”, Homi K. Bhabha claims that: “It is the trope of our times to locate culture in the realm of the ‘beyond’: an exploratory restless movement…”. He reminds us that ‘beyond’ alludes to spatial distance indicating progress by promising the future, and that this imaginary spatial distance brings forward temporal social differences where subjective and collective notions about nation, community and culture are negotiated. These cultural instances permit us to dream of a better place and to embrace the Otherness within and around ourselves as relationships to place and belonging are redefined. The project was developed under a Canada Council Media Arts Research Grant 2002.